Have we reached the point in theater that the only way to tell a generic story is to throw an outrageous structure into the fold that complicates the message and thusly hurting the credibility of the play? 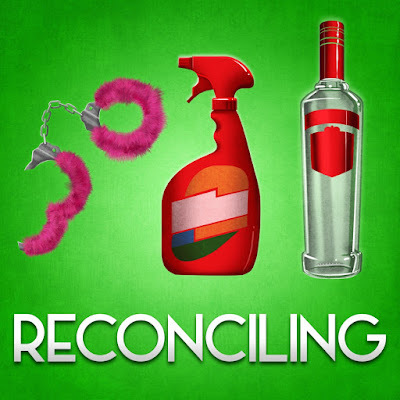 In Jenny King's overly complex Reconciling, three individual stories are thrust together on the same room as three pairs of people hope to patch up their past. What hurts King's play is the complete lack of clarity. Whether it was on her part or on the part of director Julia Hinson, Reconciling tried so hard to be something it could never be. The conceit begins with three pairs that share the same space, an apartment, and never intertwine story wise yet occasionally share lines. But then the world that was built gets destroyed when the characters begin to acknowledge one another. Why? It's not clear. For starters, there is dead air with when it comes to the dialogue structure. The forced pauses in these arguments allow the other pairs’ chat to be unnatural. In fact, trying to recover from continuation isn't seamless. But the bigger dramaturgical question Reconciling poses is why this play is set in the same room. Never once is it discussed or explained especially when three individuals say that it's theirs. If it is the history of the room over time, King must explain that clearly. As it stands now it reads as if King and Hinson wanted to avoid it feeling like an acting class exercise with rehearsal cubes. But the reality is that would have offered stronger justification. King is already in over her head with the script. By also playing a role in the show, she doesn't get the opportunity to truly listen to the script. She must step back to playwright only to hear and grasp the problems of her script. By nature of the play, it's hard to truly look at the individual performances. With pauses deflating the acting, the company did what the script prescribed. But praise must be given to this cast for being in-tune with one another. Those shared lines did happen precisely. As noted earlier, the concept hindered director Hinson's overall vision. The apartment setting was just far too cluttered for the sextet to work around easily. It wasn't until the world changed and the passing off of stories began before Hinson had the chance to make anything resembling a nice stage picture. Reconciling is an example of complexity in intricacy. It's also an example of trying to be something grander than it could be. Perhaps Jenny King should go back to the drawing board.